Don’t let the holidays drive you ape because this year, we are going to do it for you! Each year Kidrobot produces a limited edition collectible to commemorate our favorite c-words: Christmas and Chanukah! This year, Kidrobot veteran Jeremy “MAD” Madl and Kidrobot find out if banana jingle with the HolidAPE 3-inch Dunny! This seasonal simian is full of yuletide… ‘Cheer’ giving voice to Christmas rage. Mystery packaged in a foil-stamped gift box, with a little Noel-nog you could shove this in your loved one’s stocking. Can you see all the holiday excitement (or frustration) in his face? Regardless, this ape is ready for the holidays and all that comes with it adorned with the appropriate colors of red and green with symbols of holiday cheer, but that is not all because he also brought another member of his shrewdness ( a group of apes) to the party. In full holiday gear and ready to spin the dreidel and play an intense game of Kvitlech is the Chanukah HolidAPE in silver and blue. Since he is full of holiday spirit, bring the HolidAPE with you when lighting the menorah or decorating the Christmas Tree! Get your HolidAPE cheer on November 7 at Kidrobot.com, Kidrobot stores, and retailers. Besides designing this year’s stellar holiday Dunny, MAD has been busier than Santa Claus on Christmas eve it seems! 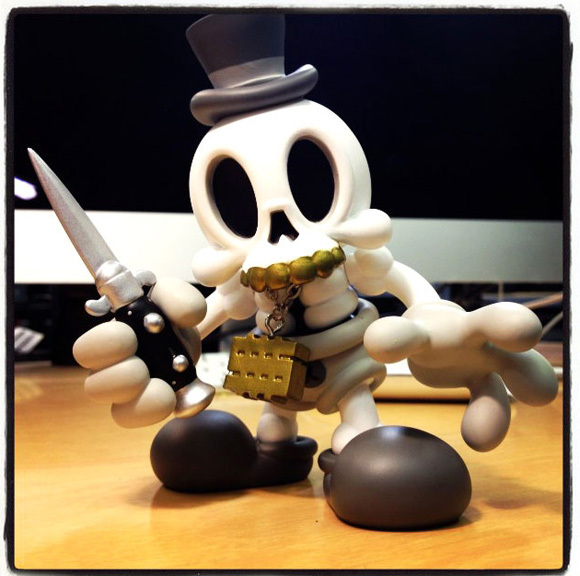 Being the toy design maven he is, MAD has started to push the envelope with his toy design. This year alone he has furthered the line of MAD*L with new 3D printed micro figures and the much anticipated new phase:4 edition . Keeping everyone up to date on his instagram with teasers and product development as it happens. Here is where we saw the development of his new Modern Hero design that grown by leaps and bounds into a stand alone figure and a bank. Seems like it was yesterday we saw the Modern Hero Dunny release. Not as if he wasn’t busy enough, Jeremy launched Madness Brand. A new outlet for apparel, prints, design, and accessories for those who hustle hard. It has been an epic year for Jeremy, but 2014 stands to be even bigger.